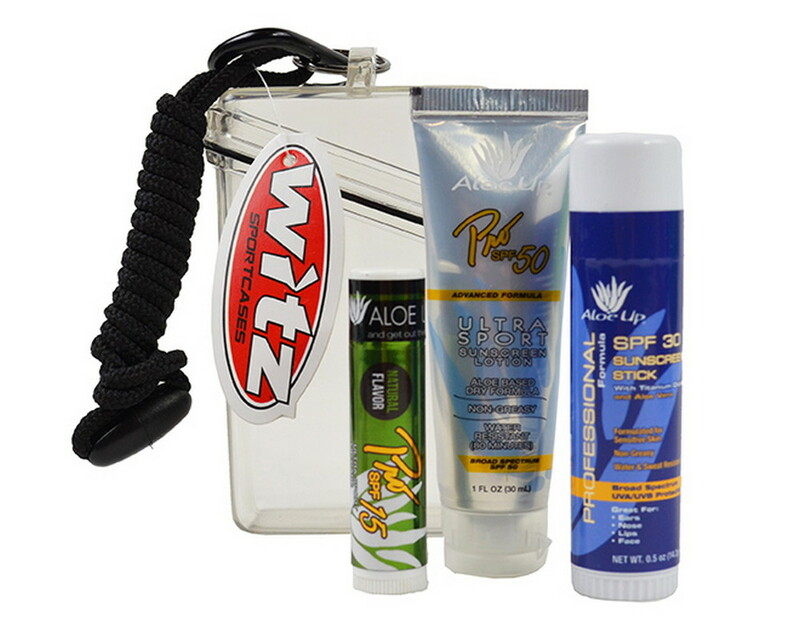 Our personalized witz case with sunscreen, sun stick & lip balm contains a natural flavored lip balm. Includes 1 oz. SPF 50, .5 oz. SPF 30 Sunscreen Stick and SPF 15 Aloe Up Lip Balm. Personalize a useful and unique gift this year and surprise your recipients like never before! Encourage sun protection and skin care with the Witz case with sunscreen, sun stick & lip balm. Made out of high quality, durable, crush resistant ABS plastic material, this case provides waterproof protection to the things stored inside. It comes with O-ring to keep dust and water away and includes a carabineer and a break away lanyard. The kit includes a 1 oz. sunscreen, 0.5 oz. sunscreen stick and a lip balm from Aloe Up. This sun protection kit is perfect for any corporate event, company picnic or casual outing. It allows inserting custom text and graphics to create a personalized promotional giveaway item that catches your brand a lot of attention.